Crunch, sweetness, and a touch of richness--this recipe has everything you want in a salad. 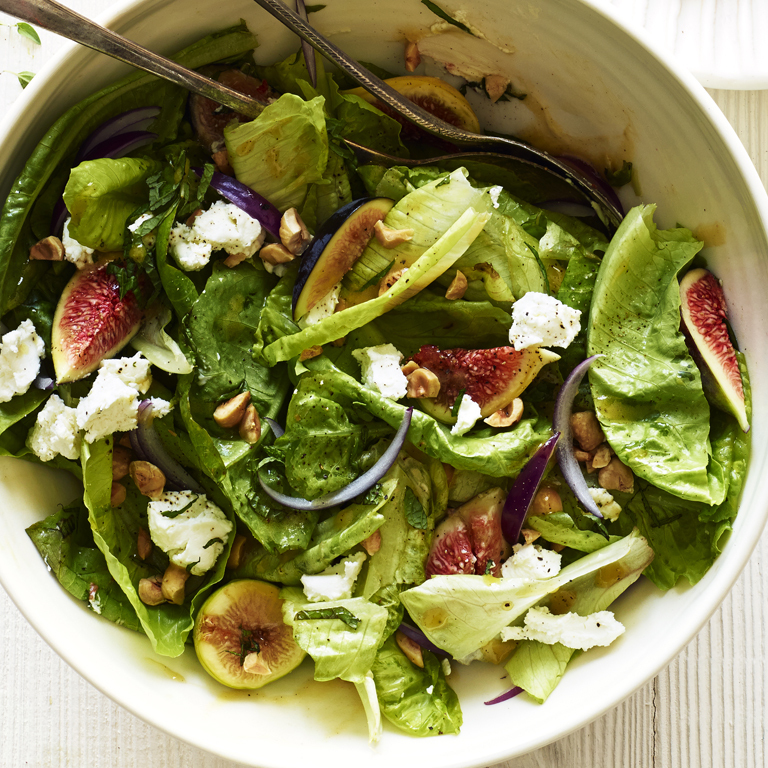 Dress the greens separately, then tuck in the soft figs and cheese so they keep their shape. Preheat oven to 350°. Toast hazelnuts on a rimmed baking sheet until fragrant and golden beneath skins, 11 to 12 minutes. Rub in a kitchen towel to remove loose skins, then chop roughly. Whisk together oil, vinegar, mustard, honey, salt, and pepper in a large bowl. Add lettuces, onion, mint, and nuts and gently toss to coat. Tuck in figs and cheese. Once dominated by dried fruit, California's fig industry, centered in the Central and Coachella Valleys, now sells a number of fresh varieties as well. Each is a little different--so try them all. Fresh figs are perishable; chill, loosely wrapped, up to 3 days. Black Mission. Purple-black skin and vermilion flesh; earthy, floral flavor. Brown Turkey. Purple-chocolate exterior; full, fruity flavor. Calimyrna. Pale yellow; buttery sweet, nutty flavor. Kadota. Light green skin changes to amber as it ripens; delicate flavor. Sierra. Another green variety; lightly aromatic with a hint of summer berries. Tiger (aka Panache). Green stripes on the outside, red inside; berry flavors. *Find Little Gem lettuce, a kind of miniature romaine, at farmers' markets and well-stocked grocery stores.